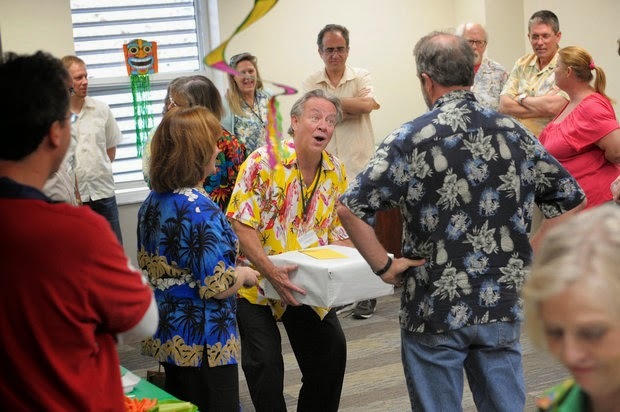 We had quite the sendoff last week for Herald columnist Vin Mannix, who has retired after 16 years here. In my column Sunday, on the rest of the op-ed page and in Vin's final column, we paid him tribute. Vin made a career out of writing about people. No detail was too small, every person was significant. And Vin made sure everyone knew that. Doak played for the St. Louis Cardinals (I swear I didn't put vin up to this story!) from 1914-1924, worked with Rawlings on a revolutionary new design of baseball gloves that became a prototype for year and retired to Bradenton. Here, Doak became a fixture in short order, with a downtown sweet shop and the patience of a saint in coaching boys' baseball. Few knew what a legend he'd been. Does Vin see a bit of himself in Doak? Maybe he should. I took a call this morning from a reader in Rubonia, upset because she hadn't talked to Vin last week before he retired. Everyone in her family has been mentioned in Vin's columns over the years -- birthdays, a wedding, a sports highlight. She didn't want me to "bother" Vin in retirement -- she said, "Just let him know Ruby is gonna miss him terribly." We know we can't really replace Vin, but we're going to keep some of his traditions going. Another Herald retiree, Carl Mario Nudi, has returned part time, and he'll start writing a weekly "People" column. Carl's a character in his own right, so we think you're going to enjoy his banter. You can send him items at cnudi@bradenton.com any time. And reporter Richard Dymond, rdymond@bradenton.com, is changing beats and will be covering health & social services, picking up where Vin left off in great coverage and story-telling about our vast non-profit world. When a newsroom staffer moves on, as I wrote in my Sunday column, it's a long-standing tradition in newsrooms to put together a front page that pays tribute to the departing compadre -- complete with touches of newsroom humor. We asked some of Vin's friends, former cohorts and community contacts to contribute, too. So here's to Vinny. Enjoy retirement! Americans love to eat out -- at least once a week, sometimes three or four times, national surveys show. And the younger you are, the more likely you'll hit restaurant row in the next couple days. But one trend is changing, according to a twice-annual industry survey. In ranking the top reasons they might not eat out, consumers say they will dine out less frequently this year because of concerns about health, the North American Restaurant Consumer Sentiment Review found. That's a big change from during the Great Recession, when financial woes were the No. 1 reason likely to dampen restaurant visit frequency, the survey showed. As the economy improves, we're venturing back to our favorite eateries more often. Tourists and residents alike have plenty of choices in Manatee County. We're blessed with an abundance of local, original restaurants and top-notch chefs who are creating innovative fare. And, starting today, we're helping you get to know our favorite chefs. “In the Kitchen with ...” will feature local chefs sharing their thoughts on the local food scene, favorite recipes, cooking techniques, farm-to-table and more. The column -- the brainchild of Herald Features Editor Jana Morreale -- will publish every Wednesday in Taste, and the series will be shared online at Bradenton.com/in-the-kitchen. 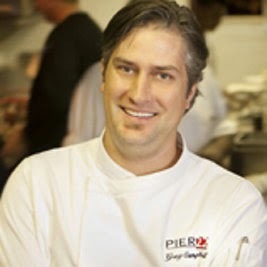 Today's first serving comes from Chef Greg Campbell of Pier 22 in downtown Bradenton. In this inaugural "In the Kitchen," Chef Greg introduces us to his Grandma Simone, who embraced the love of shopping locally and instilled a glorious sense of community in her grandson. And he shares a family secret I can't wait to try: Grandma Simone's very own recipe for “chowdah”. Interested chefs should contact Jana at 941-745-7059 or jmorreale@bradenton.com. "I loved your commentary in today's Herald. I'm so glad you're getting Holy Molé back. I used to enjoy it so much, and have missed it. Our world needs more of that which brings joy, and also makes us "stop and think about life" as you so beautifully expressed in your article. Thank you." That was one of a dozen or so e-mails I received on Sunday, thanking the Herald for the return of Holy Molé, a cartoon strip by local artist Rick Hotton and a source of joy and retrospection for his loyal followers. As I wrote in my Sunday column, we thought the long-term hiatus of Garry Trudeau's 'Doonesbury' was the perfect opportunity to bring Holy Molé back. So check him out. He's situated right above the crossword puzzle today on Page 5C, and will be there every day -- and he'll be in the color Sunday funny pages, too.